If you have ever wondered how to start a woodworking business, then this is article is going to help you do that. Woodworking is a craft that can see you earn a decent second income. Wood is abundant, readily available and a very versatile material that is very often used to make items of furniture. The thing is that you often know a lot more than the average folks when it comes to woodworking. There is probably a lot of information and know-how that you take for granted. What seems easy for you may seem very difficult for other people and here lies a serious money making opportunity. There are people who love woodworking, but just do it as a hobby and that's fine. The good news is that if you have interest & even a basic basic ability in woodworking, then transforming it from a hobby to business is quite effortless and this article is just going to give you an outline into how this may be done. As you will see the barrier of entry is very low into this business. It is very easy to start a small woodworking business and there are many woodworking ideas to make money with. A good set of tools is essential. You can borrow or buy these but you may want to shop around and check the classified newspapers or the online classifieds e.g. craigslist.org. I am sure that there are lots of people advertising their tools for pennies on the dollar. The kind of tools that you will need for your projects will depend on the nature of your business. If you want to start selling small items e.g. tables, chairs and/or toys, then having simple hand tools may prove to be adequate. Larger projects may need bigger tools. Craigslist.org, as I have mentioned before, is one of the biggest websites of its kind and there's plenty of people offering their tools for sale and sometimes for free. It is most popular in the USA where there are sections for every state. If you live in America this will be a very useful resource if you need to find tools & even wood for your woodworking business. Make sure you advertise. Again the classifieds can be a huge source of revenue for you that is if you don't want to make your own website. Ebay has been around for about 15 years and is still going strong. Which just proves that people buy stuff from one another over the internet and are completely comfortable doing so. There are many ways that you can advertise your products. You can use the internet. Using the internet will need you to put up a website. You can have a variety of sample pictures on the website. You also need to know all the ways of putting up a good website if you want to get enough traffic. You need to use the internet to not only advertise, but also to sell. With the website you will be able to tap into potential markets that cuts across country boundaries. The amount of money you make from your woodworking will be directly proportional to the ease and speed at which you build your projects. This being said the fastest way to get building your projects will be if you have the plans already. Plans have been carefully thought out and I do recommend that you purchase a good set of plans. Trying to design your own projects is only going to cost you lots of time and there is no point in reinventing the wheel. Wood can be sourced from numerous places. Even scrap wood can be cleaned up and turned into beautiful woodworking project. Stripping down old pallets can be a useful source of wood and nearly every business in town will have some that they were going to throw out anyway. Again check Craigslist.org! It would be great if you could have the use of a big workshop full of the latest machinery and tonnes of wood. 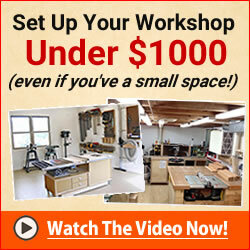 This may not be a realistic option for you but all really need is a workbench and an empty room in your house. If you live in a dry region then you may even prefer to build your woodworking projects outdoors. You will probably need a clamp on your bench. This can be as easy as telling your friends that you have stuff for sale. Other methods will include posting adverts on classifieds (online and offline). Below is a list of classified type websites that will help get you started on making decent income from your woodworking. Posting an advert on any of these sites is free. Of course at the end of the day word of mouth is very powerful and advertising a yard sale may end up being a terrific income stream especially if you live in a built up area. If you plan on making a catalogue of items and let your customers browse your website for items to buy then you may easily do this. There are many great resources out there to help you start your own ecommerce store. To start a website you basically need a domain name and some hosting. The domain name is basically the .com or the .dot org name. Your website will need hosting to store all the files that your website contains, for example the pictures of your woodworking projects and the text of your site. As long as the woodworking business owner can commit to delivering the goods everything else is easily done even if you don't have good web technology skills. Tip: if you sign up with bluehost for your website hosting then you get a free domain. There is no end to the range and scope of woodworking business opportunities. There are literally thousands of items you could build and sell. So the name of the game here is to build quickly and cheaply any woodworking item that has a high value. The more valuable people see the item the more you can charge. I will go into more detail with this later on in this series of woodworking business startup blog posts. Thanks for reading my blog post. I hope that you have gained value from this post. I will be updating this blog with many different articles and tutorials. I hope that you take the plunge and make a good income with your woodworking business startup.